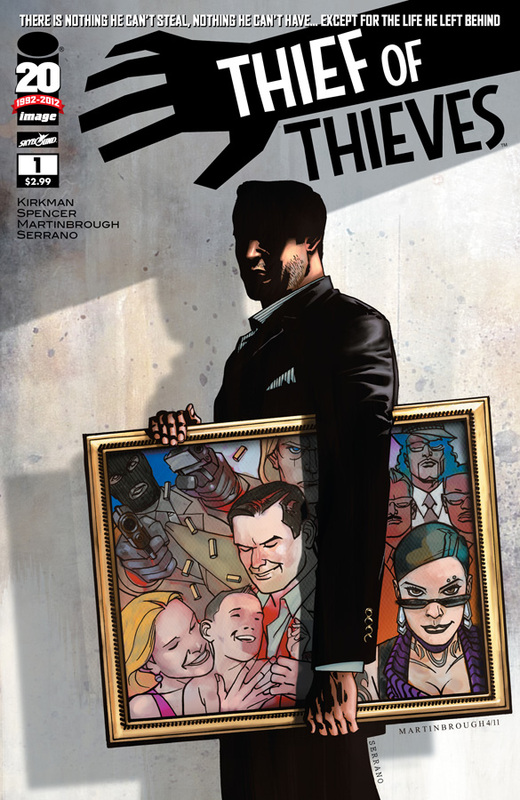 The Fellowship was fortunate enough to obtain a copy of THIEF OF THIEVES #1 from Skybound Entertainment and Image Comics. The story is by Robert Kirkman, written by Nick Spencer with art by Shawn Martinbrough. The book starts with our protagonist – Redmond doing what he does best, being a thief. We then flashback to a time where Redmond meets his future assistant/apprentice Celia while she is trying to steal his car. Coming back to the present, Redmond and Ceila discuss the next job and he appears to be his reluctant to start the operation. This leads to a surpirse meeting with the participants of the job plus their financial backer – Arno. After a toast in his honor, Redmond drops a bombshell on the gang of thieves and the readers. I was drawn to this book because of the names behind it. Robert Kirkman (INVICIBLE, THE WALKING DEAD) and Nick Spencer (MORNING GLORIES, T.H.U.N.D.E.R. AGENTS) are great writers. This issue was a nice start to the series. The flashback sequence between Redmond and Celia was a nice touch. It showed not only does he is very knowledgeable of his trade, but he is a caring person. He’s unpredictable and that’s what makes him interesting. Shawn Martinbrough’s (BLACK PANTHER: THE MAN WITHOUT FEAR, CHALLENGERS OF THE UNKNOWN (1997 series)) art is great as always. It’s beautiful and moody at the same time. THIEF OF THIEVES #1 is out in stores now or at www.imagecomics.com.